Although this smart little bird breeds in the State of Louisiana and the adjacent districts, it is not there found in so great numbers as in the Middle States, and farther to the northward. It generally prefers the depth of the forests during summer, after which it approaches the plantations, and even resorts to the granaries for corn. Its flight is short, the bird being seldom seen on the wing long enough to cross a field of moderate extent. It is performed by repeated flaps of the wing, accompanied by jerks of the body and tail, and occasions a rustling noise, as it takes place from one tree to another. It moves along the branches, searches in the chinks, flies to the end of twigs and hangs to them by its feet, whilst the bill is engaged in detaching a beech or hazel nut, an acorn or a chinquapin, upon all of which it feeds, removing them to a large branch, where, having secured them in a crevice, it holds them with both feet, and breaks the shell by repeated blows of its bill. They are to be seen thus employed for many minutes at a time. They move about in little companies formed of the parents and their young, eight or ten together, and escorted by the Nuthatch or the Downy Woodpecker. It is pleasing to listen to the sound produced by their labour, which in a calm day may be heard at the distance of twenty or thirty yards. If a nut or an acorn is accidentally dropped, the bird flies to the ground, picks it up, and again returns to a branch. They also alight on the ground or on dry leaves, to look for food, after the trees become bare, and hop about with great nimbleness, going to the margins of the brooks to drink, and when unable to do so, obtaining water by stooping from the extremity of a twig hanging over the stream. In fact, they appear to prefer this latter method, and are also fond of drinking the drops of rain or dew as they hang at the extremities of the leaves. Their notes are rather musical than otherwise, the usual one being loud and mellow. They do not use the tee-tee-tee of their relative the Black-capped Titmouse, half so often as the latter does, but emit a considerable variety of sounds, many of which, if the bird from which they come does not happen to be known to the listener, are apt to induce disappointment in him, when on going up he finds it to be very different from what he expected. These sounds sometimes resemble a whistle, at another time a loud murmur, and seem as if proceeding from a bird at a much greater distance. The crest of this species, which is generally erect, is a great improvement to its general appearance, the tints of the plumage being, as you perceive, kind reader, none of the most brilliant. The Crested Titmouse is of a rather vicious disposition, which sometimes prompts it to attack smaller birds, and destroy them by thumping their heads with its bill until it breaks the skull. This species sometimes forms a nest by digging a hole for the purpose in the hardest wood, with great industry and perseverance, although it is more frequently contented with the hole of the Downy Woodpecker, or some other small bird of that genus. It fills the hole with every kind of warm materials, after which the female deposits from six to eight eggs, of a pure white, with a few red spots at the larger end. The eggs are laid about the beginning of April in the Southern States, and nearly a month later in the Middle Districts. As soon as the young are able to leave the nest, they are seen following the parent birds, and continue with them until the next spring. My friend Dr. BACHMAN informs me, that he "kept a bird of this species in confinement for some time. It was in the habit of hiding its food in the corner of its cage in a crevice, and at night crept into a small box, where it lay doubled up like a ball till the first light of the morning, when it resumed its restless habits, continually trying to escape from the cage." This species was not seen by Mr. TOWNSEND on the Rocky Mountains, or near the Columbia river; and Dr. RICHARDSON does not mention its occurring in the Fur Countries. I found it abundant in the Texas, and in all our Atlantic States, as well as in Nova Scotia. In this species as in the rest, the palate is flat, with two longitudinal ridges; the posterior aperture of the nares oblong-linear; the tongue 3 1/2 twelfths long, emarginate and papillate at the base, flat above, horny toward the end, with three grooves terminating abruptly, and furnished with stiffish bristles. The oesophagus is 2 inches long, and of the uniform width of two-twelfths; the proventriculus a little wider. The stomach is small, elliptical, 4 1/2 twelfths long, 3 1/2 twelfths broad; its lateral muscles moderate; the epithelium longitudinally rugous, and reddish-brown. The intestine is five inches long, from 2 1/2 twelfths to 2 twelfths in width; the coeca extremely small, about 1 twelfth long, and 1/4 twelfth in width. There is on each side a very slender salivary gland with two ducts. The trachea is 1 inch 4 1/2 twelfths long, of the uniform width of 1 1/2 twelfths, considerably flattened; its rings 60, the bronchial half rings 12. The muscles as in the Warblers and Thrushes. 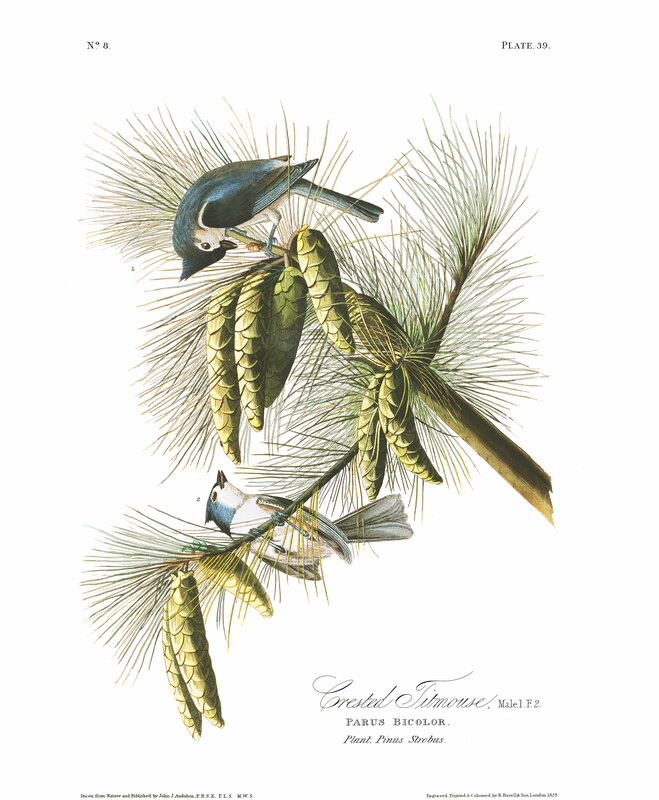 The species of pine, on a twig of which you see a pair of these birds, is the white pine (Pinus Strobus), a tree of great beauty, of which individuals have been observed of the enormous height of 180 feet, with a diameter at the base of from six to eight feet. The trunk is branchless for two-thirds of its height, and affords the most valuable wood perhaps of any tree in the United States. CRESTED TITMOUSE, Parus bicolor, Wils. Amer. Orn., vol. i. p. 137. PARUS BICOLOR, Bonap. Syn., p. 100. TUFTED TITMOUSE, Parus bicolor, Nutt. Man., vol. i. p. 236. CRESTED TITMOUSE, Parus bicolor, Aud. Orn. Biog., vol. i. p. 199; vol. v.p. 472. Bill, short, straight, rather robust, compressed, acute; both mandibles with the dorsal outline arched, the upper slightly declinate at the tip. Nostrils basal, roundish, concealed by the recumbent feathers. Head large. Neck and body robust. Feet of ordinary length, rather robust; tarsus compressed, anteriorly scutellate, a little longer than the middle toe; outer toe slightly united at the base, hind one much stronger; claws rather large, much compressed, arched, acute. Plumage blended, tufty; feathers of the upper part of the head elongated into a crest. Wings of moderate length, the second, third, and fourth quills nearly equal and longest. Tail long, even, of ten rather narrow, rounded feathers. Bill black. Iris dark brown. Feet lead-colour. The general colour of the upper parts is a dull leaden-blue; the forehead black; sides of the head lighter, and tinged with brown. Under parts greyish-white, sides tinged with yellowish-brown. Length 6 1/2 inches, extent of wings 9; bill along the ridge 1/3 along the gap 1/2; tarsus 11/12, middle toe 3/4. Adult Female. The female hardly differs from the male in external appearance, being equally crested, and having the same tints. PINUS STROBUS, Willd. Sp. Plant., vol. iv. p. 501. Pursch, Flor. Amer., vol. ii. p. 644. Mich. Arb. Forest. de l'Amer. Sept., vol. i. p. 104, Pl. x.--MONOECIA MONADELPHIA, Linn.--CONIFERAE, Juss. This species, which is a true pine, has the leaves very slender, five together, with very short sheaths, and is further characterized by its cylindrical, pendulous cones, which are longer than the leaves, and have their scales lax. It grows in rich soil, in all parts of the United States from Canada to Virginia, and affords the best timber for masts, as well as for other purposes. In Britain, where it has long been planted, it is generally known by the name of Weymouth pine, or Lord Weymouth's pine, from the name of the nobleman who introduced it.